The cleansing potential of strawberries is perfect for enhancing the beauty of the skin. Eating strawberries helps your body flush out dead skin cells as well as other impurities. The vitamin C power of strawberries is also essential for repairing damaged skin; a single cup a day can help you support the body’s ability to repair damaged skin tissue. Walnuts have the ability to enhance both skin and hair. Rich in vitamin E, protein, and omega-3s, these nuts pack a healthy punch for your tresses. Walnuts also help the skin retain its youthful glow by promoting the body’s natural detox ability and offering some skin protection from harmful UV sun rays. Delicious and healthy, walnuts are a great beautifying snack on the go. 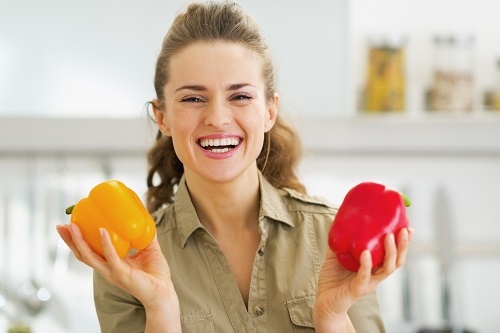 Red peppers are great for perfect skin. They help keep your skin nourished with the nutrients it needs to thrive and provide added protection from free radicals and harmful UV rays. They are also rich in vitamin E and beta-carotene which enhances the beauty of the skin. In fact, one of the best things you can do to keep your skin looking youthful is to include more red peppers in your diet. They are versatile and can be added to various types of cuisine for delicious results. Not only is Greek Yogurt a great part of any diet and can enhance your fitness plan, it can support the beauty of your hair, nails, and even skin. This yogurt’s natural enzymes and lactic acid helps nourish and protect the skin as well as the nails and hair. Moreover, because it promotes a healthy digestive tract, it allows the body to more regularly get rid of waste and other toxins naturally which can certainly enhance the look of your body. The rich protein content in eggs can enhance anyone’s tresses! Your hair needs protein to grow and for strength. Additionally, eggs have a high iron content which is also important for a healthy mane of hair. Iron promotes the body’s ability to deliver important oxygen to hair follicles; without it, there is increased risk for hair loss. Olive oil is loaded with antioxidant and anti-inflammatory qualities. While many ancient as well as modern sources have written on the ways olive oil can be used topically to enhance the look of skin and hair, it is also a great beautifying agent when part of a diet. With its many health benefits, including its ability to promote heart health, olive oil is a must for a healthy diet as well as one designed with beauty in mind. The omega-3 fatty acids in salmon are essential for the body in general, but they also support hair growth. If you want to grow long and healthy tresses, be sure to include salmon in your diet. The omega-3s in salmon are found in your scalp as well as in the natural oils of your hair which are essential for keeping it moisturized. Well-moisturized hair is less prone to breakage and certainly helps the hair look beautiful and healthy too. Blueberries are noted for their anti-aging benefits. They can help keep the skin looking healthy and youthful with their anti-inflammatory properties and antioxidant protection. They can even help your eyes look bright! Convenient and delicious, a snack of blueberries is always a good idea; add them to your morning cereal or oatmeal to benefit from their beautifying effects. Since hair loss can be linked to a lack of zinc in the diet, eating zinc-rich foods likeoysters has the potential to promote a thick and luscious crop of hair. Interestingly, oysters can even promote eye-lash growth! While other foods contain zinc as well, oysters also have a high protein content which is an essential building block for your hair. Tomatoes have the unique ability to bolster skin cells so they are better able to guard against damage from UV rays. They are rich in vitamin A which the skin needs to prevent dryness. Well moisturized skin appears particularly attractive and youthful. The antioxidant power of tomatoes also helps keep the skin in excellent condition by providing protection from free radical damage. Ramp up their power by cooking them first; cooked tomatoes have even more unlocked nutritional power than fresh ones! Incorporate these beauty foods into your eating plan and you will always look beautiful. What are your favorite beauty foods?